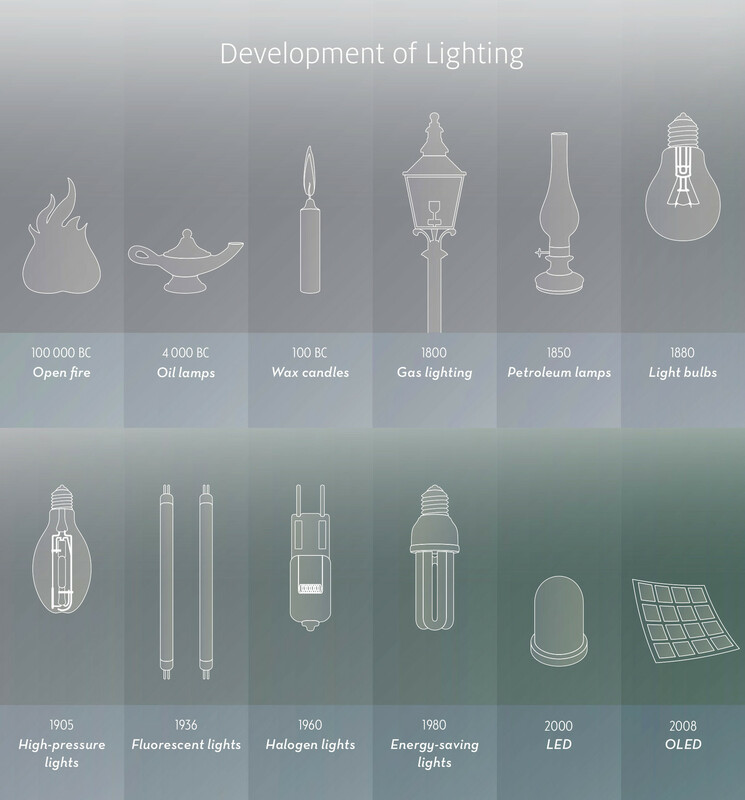 Over the years, the technology of light has changed drastically as science has evolved, yielding new sources, materials and innovations for lighting. Since humble beginnings when an open flame served as the primary source of light, technologies have advanced to the age of the LED. Advancements in lighting technology are not limited to the light source, but include all luminaire components – today we consider not only the light source itself, but also a luminaire’s materials, aesthetics and efficiency. Zumtobel takes this a step further as we consider the impacts of lighting on people. Innovations such as our Luminance Reducing Optic (LRO), which reduces glare and enhances visual comfort in offices, or our True Gamut Rendering (TGR) technology that provides authentic color representation at retail, distinguish Zumtobel luminaires and help us to offer the highest possible quality of light. Light emitting diodes are modern semiconductor devices. Their characteristics are determined by their materials, mechanical design and operating mode. The active semiconductor layer, in which radiation is produced, is sandwiched between a positive and a negative substrate inside the LED. Actual colored light is produced, depending on which materials are chosen. High-quality white light is produced by blue LEDs with yellow luminescent substances. A mixture of RGB (red, green, blue) also produces white. The smallest LED chips have a side length of approx. 250 μm (1 micrometer = 1 one thousandth of a millimeter). As a rule, they are powered via appropriate DC converters. Their very long service life of over 10,000 hours demands optimized thermal management in order to prevent overheating. Today, LEDs are some of the most efficient light sources for general lighting. They are completely superseding traditional light sources in many applications. Zumtobel is a fully-LED lighting manufacturer. Use: LEDs can be used for both functional and decorative lighting in indoor and outdoor locations. The direction of light is based on three fundamental principles: reflection, refraction and diffraction. 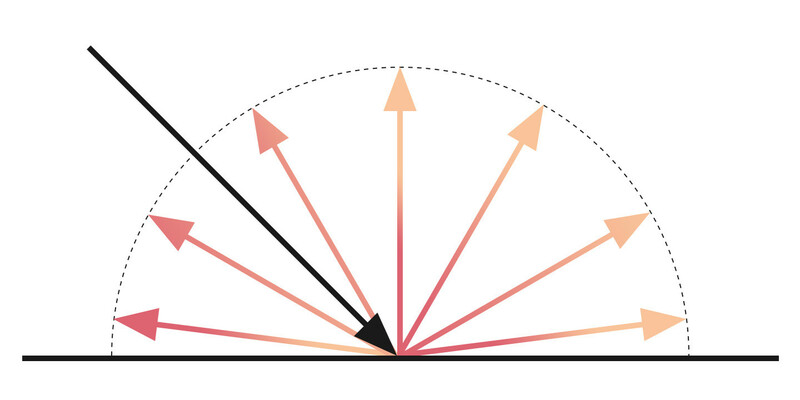 These principles are applied to define the photometric properties of luminaires in terms of lighting patterns. High-precision light direction structures made of tried-and-tested as well as innovative materials extend the range with a view to both optics and design. 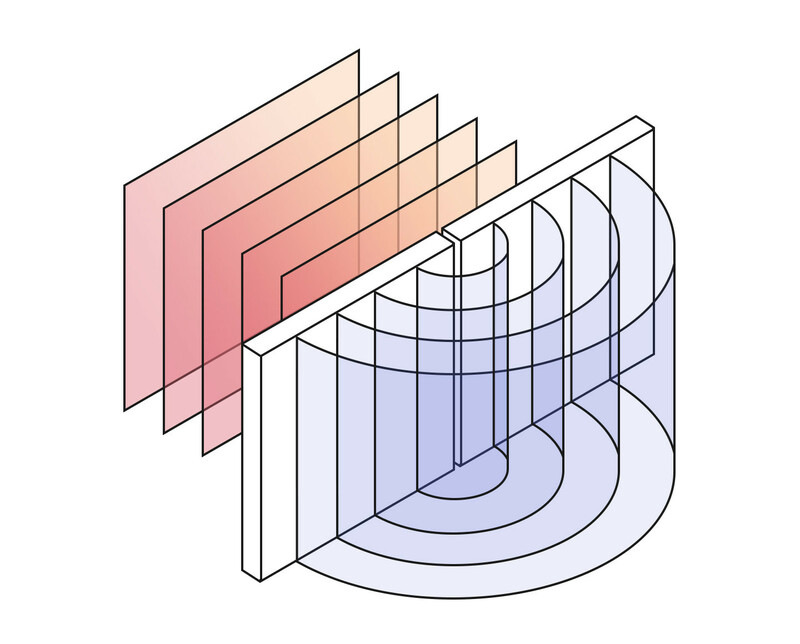 In physics, reflection is the change in direction of a wavefront at an interface between two media with a differing refractive index so that the wavefront returns to the medium from which it originated. 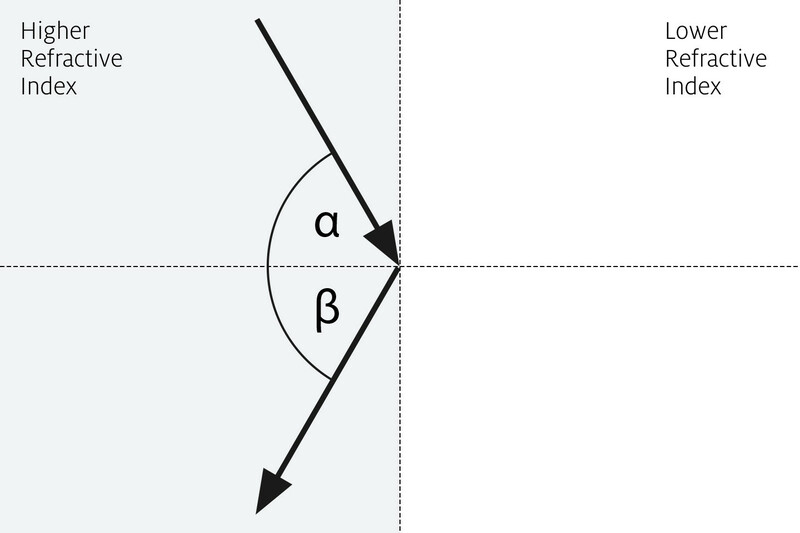 Nearly all light is reflected according to the law of reflection (incident angle = reflected angle). The aim is to reflect as much light as possible, absorbing only little of it. Nearly all light is reflected diffusely: light is reflected in all directions, in accordance with Lambert’s law, so that the reflecting surface appears equally bright from any direction of view. Here, too, the aim is to reflect as much light as possible and absorb only little of it. A beam of light coming from a medium with a higher refractive index that hits the boundary to a medium with a lower refractive index will be reflected away from the incident slot. If the incident angle is further increased, total reflection will occur at a critical angle. This means that the light beam does not pass out from the material with a higher refractive index, but is reflected back. Refraction indicates the change in direction of a wave due to a spatial change in its rate of propagation. For light waves in particular this phenomenon is described by the refraction index of a medium. 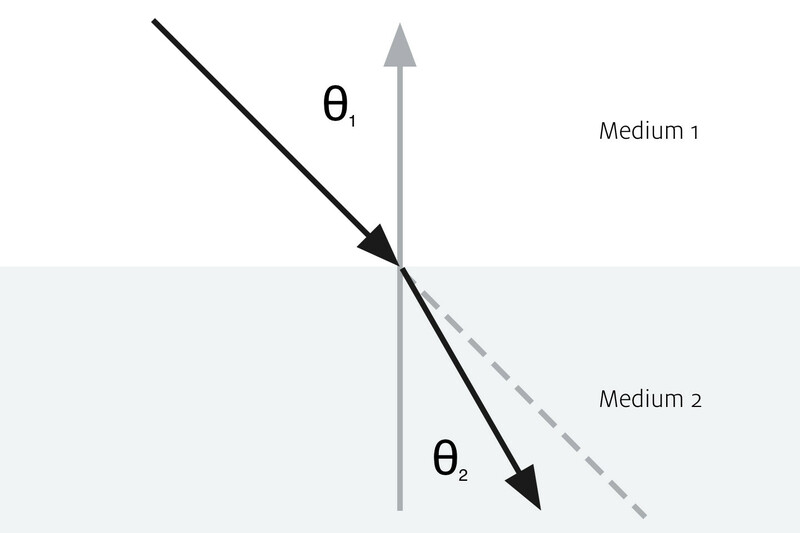 At the transition between two media with a differing refraction index, the beam therefore changes direction according to Snell’s law of refraction. 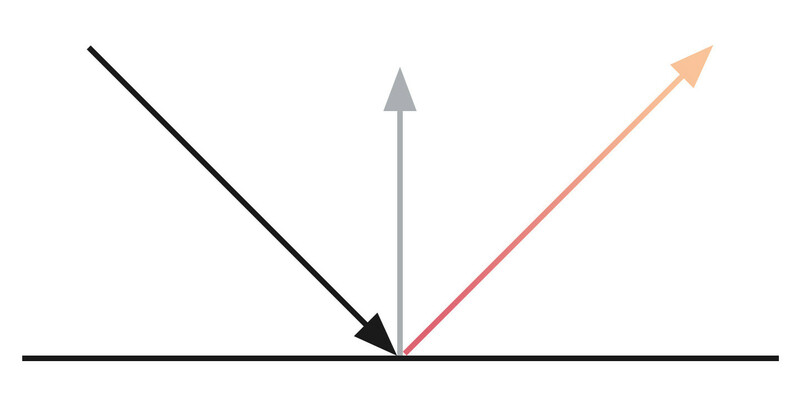 If light encounters periodic structures with expansions in the wavelength of light, it is diffracted (see illustration). Such structures may be transmission grids, reflection grids (phase grids) or holographic grids, for example. Diffraction of chromatic light results in an unfolding of the light spectrum.